Best Skillet of 2019 | 18 of the Top skillets rated, review and tested! A kitchen without a good skillet is – well, it is really not a kitchen. 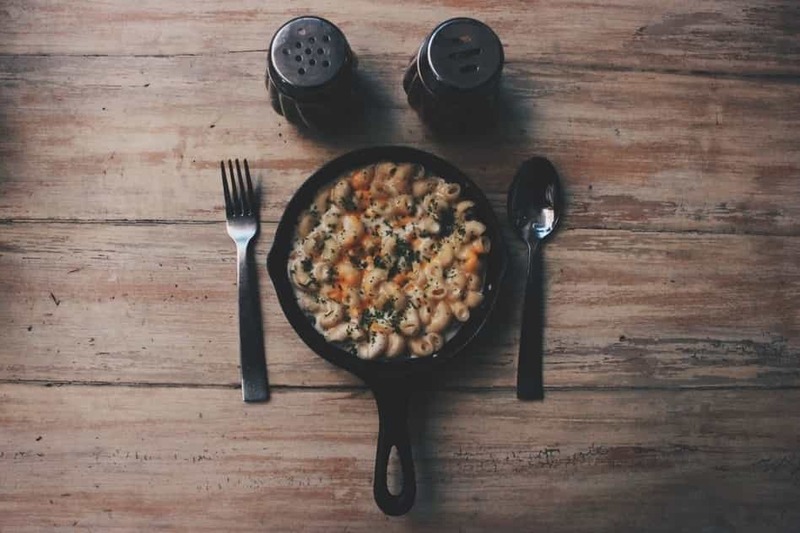 Whether you’re making breakfast, lunch, or dinner, using an electric cooktop or an induction cooktop, whatever dish you decide to make, there is a good chance you’ll need a skillet at some point. 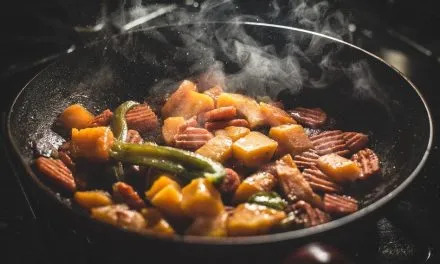 Having a good quality skillet at hand can make cooking much more enjoyable. For this reason, we’ve tested and reviewed all of the most popular skillets to create this guide on best skillets in every category. No matter if you are looking for a non-stick skillet, an electric one, or maybe a cast iron one, you’ll certainly find something you like on this list. This beautiful skillet from All-Clad features five alternating layers of stainless steel and aluminum. 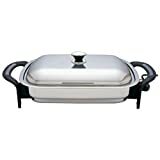 The stainless steel exterior makes the pan durable, resistant to damage, and dishwasher-safe, while the inside aluminum layer provides superior heat conductivity. Most importantly, the pan is completely oven-safe since all parts are made of metal, including the stainless steel lid. When we say completely, we mean up to 600 degrees Fahrenheit, according to the manufacturer’s instructions, but no household oven goes beyond this temperature which means it would be very hard to ruin this pan. When it comes to dishes that require transferring the pan from the stovetop into the oven, cast iron is definitely one of the best materials to go with. Cast iron is known for its heat retention properties – once it gets hot, it stays hot for a long time. This allows you to maintain a stable temperature in the pan when the recipe requires starting on the stovetop and finishing in the oven. 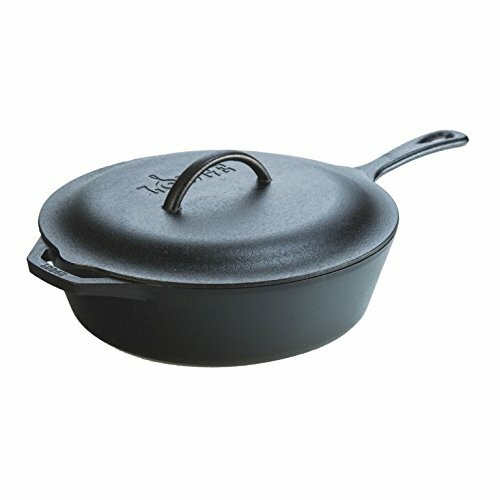 The Lodge L10CF3 Cast Iron Covered Deep Skillet is the perfect example of a versatile cast iron pan. This heavy-bodied pan is 12 inches wide and 4.5 inches deep which makes it suitable for a variety of dishes made both on the stovetop and in the oven. It has a long handle on one side and a small helper handle on the other. It also comes with a nice cast iron lid. Both the lid and the pan are completely oven safe. This skillet also comes pre-seasoned so you can use it right out of the box. 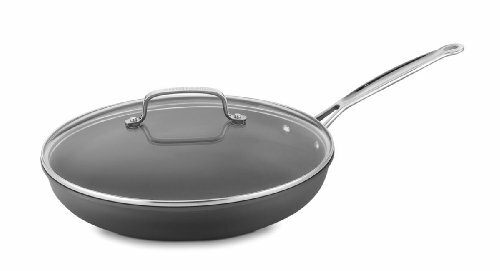 This pan belongs to Cuisinart’s Chef’s Classic Nonstick Hard-Anodized collection. It is made of hard anodized aluminum with a nice graphite finish on the exterior which we really love. The cooking surface has a special non-stick finish that is PFOA-free and reinforced with titanium. Unlike many other non-stick pans, this one is actually oven-safe up to 500 degrees Fahrenheit, thanks to the reinforced non-stick coating. This pan is 12 inches wide, which is a nice size for everyday cooking. This pan does not have a long handle like most skillets have. Instead, it has two loop handles on the sides. The loop handles make it easier to place the pan in the oven, but otherwise, it is just like a regular pan. A domed lid made of tempered glass with stainless steel rims and handle is also included. This skillet from All-Clad is made of stainless steel with an aluminum core sandwiched between the stainless steel layers. This means you get the sturdiness of stainless steel and the heat responsiveness of aluminum all in one. The cooking surface is highly polished and features a special starburst finish that helps prevent food from sticking to the pan. It is really as close as you can get to a non-stick coating without actual coatings, and since it’s stainless steel, it will last virtually forever. This All-Clad 41126 Stainless Steel Fry Pan is also dishwasher safe, compatible with induction stovetops, and oven-safe up to 600 degrees Fahrenheit. 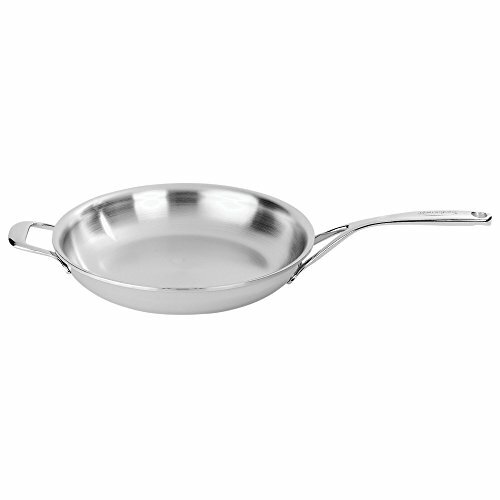 The Demeyere Proline 5 Star 11 Inch Fry Pan is truly what you call a top-of-the-line skillet. It works beautifully on all kinds of stovetops, including induction. Thanks to the stainless steel exterior, this pan not only looks beautiful, but it’s also very durable and almost impossible to scratch. You can wash it in the dishwasher, use metal utensils with it, or scrub by hand as much as you like if it gets really dirty – it’s pretty much indestructible. All of its parts, including the handles, are made of stainless steel, which also makes it completely dishwasher safe. Moreover, this Demeyere skillet is actually three-layered. There is an aluminum layer sandwiched between the stainless steel internal and external layers. Since aluminum is a very good heat conductor, this allows the pan to heat up quickly and evenly. The aluminum layer goes all the way up to the sides of the skillet too, which is not always the case. This stainless steel skillet from Cuisinart is simple, functional, and reasonably priced. 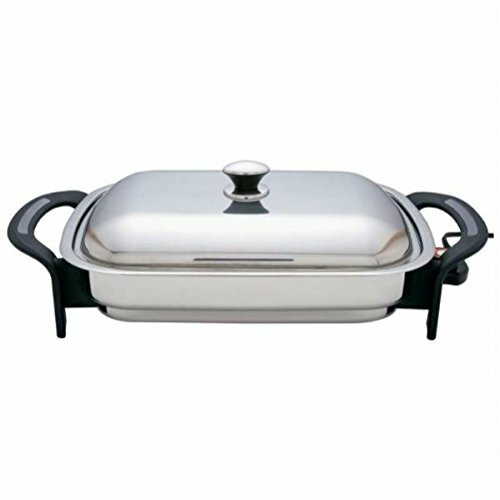 It’s a good choice for those looking for quality stainless steel cookware on a tight budget. Despite the lower price, it is not much different from the two skillets we mentioned above. The exterior and the interior are made of 18/10 stainless steel, as is the handle, while the inner core is made of aluminum for better heat conduction. With a diameter of 14 inches, this pan is quite large, but we know many cooks enjoy cooking with larger skillets. Moreover, the Cuisinart 722-36H Chef’s Classic Stainless features a nice helper handle along with the classic long handle, so you’ll surely be able to lift it securely despite the size. 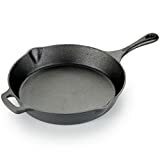 Lodge is a company with 120 years of experience in making cast iron cookware and they really know how to make a pan that will last for years and this is certainly true when it comes to the Lodge L8SK3 10.25 inch Cast Iron Skillet. This is a classic cast iron skillet – simple, but still amazing, and amazingly affordable. It has two pouring spouts on the sides to prevent any spilling, a long handle on one side (not too long though, which allows the pan to easily fit in the oven), and a helper handle on the other side. The handles do get hot, though, but Lodge also makes a silicon handle cover that gives the ability to hold the handle without oven mitts. With cast iron skillets, the seasoning can make all the difference in the world. Luckily, this skillet comes pre-seasoned, and the seasoning doesn’t contain any synthetic coatings or chemicals either. Instead, it’s seasoned only with vegetable oil. Most cast iron skillets look similar, and this is simply because you can’t go wrong with the classic design. This cast iron skillet from T-fal looks quite similar to the Lodge skillet we previously mentioned, but it’s a bit larger, measuring 12 inches in diameter. 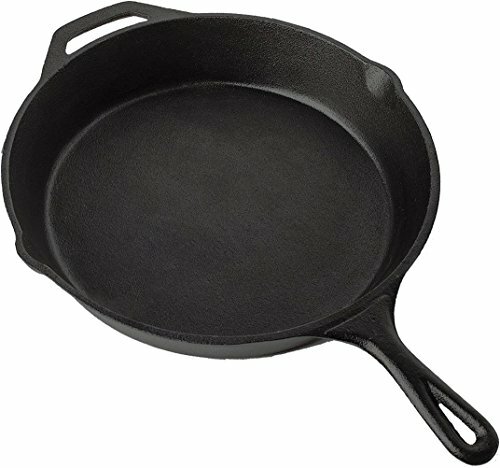 Cast iron is quite heavy, so it shouldn’t surprise you that this pan weighs as much as 9 pounds which equals to 4 kilograms. Cast iron skillets simply need to be as heavy, since a thick layer of cast iron is necessary for the amazing heat retention this pan provides. It shouldn’t be too hard to handle it, though, since there is a nice, long, well-balanced handle on one side and a helper handle on the opposite side. Utopia Kitchen Pre-Seasoned Cast Iron Skillet is another beautiful classic cast iron skillet. This one is even larger than the previous one – measuring 12.5 inches in diameter. However, it is also slightly lighter, weigh 8 pounds altogether. Therefore, you might want to opt for this one if you find the weight of cast iron pans problematic. The sides of the pan are gently sloping towards the bottom, but not too much. This pan from Tramontina is one of the most rugged non-stick pans available. 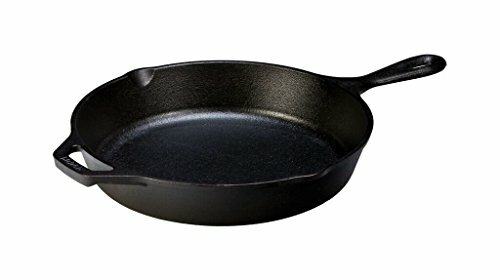 Non-stick pans have a reputation of being flimsy and not very durable, but with this skillet, this is certainly not true! It’s made of heavy-gauge commercial-grade aluminum that can definitely withstand everyday use in the kitchen. The Tramontina 80114/535DS Professional Aluminum Nonstick Restaurant Fry Pan also features a beautiful brushed finish on the outside and a securely riveted stainless steel handle with a silicone grip. The silicone remains cool to the touch on the stove, while the fact that you can remove it makes it much easier to clean the pan. Most importantly, the cooking surface of this skillet is covered with a non-stick coating that doesn’t contain any harmful chemicals. There is no PFOA, lead, or cadmium, which means your food will remain safe even when used at high temperatures. This convenient pan from Calphalon is made of heavy-gauge aluminum which allows the pan to heat up really quickly and cool down just as fast, resulting in amazingly precise temperature control. 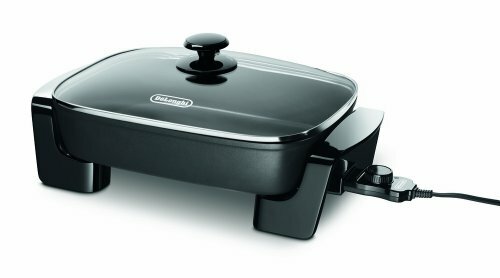 It also boasts a hard anodized exterior finish which makes this pan twice as durable as regular aluminum pans. The inside surface is covered with a non-stick coating and you’ll be glad to know that it is PFOA-free which means there are no harmful chemicals released even at high temperatures. The coating is also dishwasher safe and it won’t get damaged by metal utensils which is always a good thing. 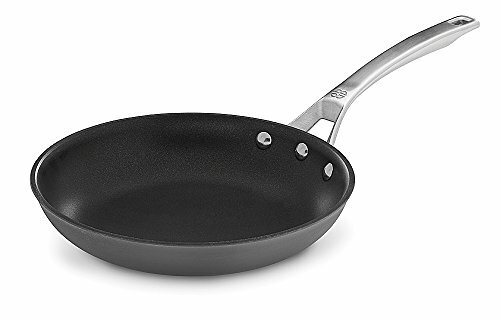 Finally, Calphalon 1948259 Signature Hard Anodized Nonstick Omelet Pan comes with a handle made of stainless steel with a brushed finish that remains cool on the stove top. It is a small detail, but not irrelevant! Overall, a great, versatile pan that you’ll most likely use every single day. This non-stick skillet from Cuisinart is a bestseller on Amazon, and this is certainly not a coincidence. 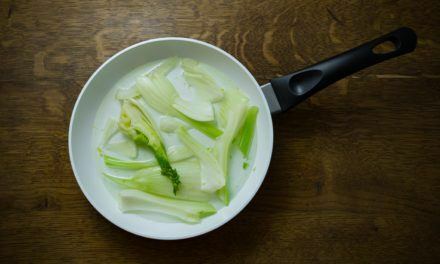 In fact, this skillet is simple and affordable, but it comes with all the necessary features you need in a non-stick skillet. It’s made of hard anodized aluminum which makes it durable and impact resistant, complemented with a stainless steel handle and a nice lid made of tempered glass. Moreover, the non-stick coating on this pan is reinforced with quantanium, which makes it amazingly durable. The pan is also oven-safe up to 500 degrees Fahrenheit. It also features a nice rolled rim that prevents dripping. Electric skillets are great because you can use them to cook literally anywhere where there is a power outlet. However, we have found that the Precise Heat KTES4 16-Inch Rectangular Surgical Stainless Steel Electric Skillet is also quite useful when used in the kitchen as an extension of your stove. 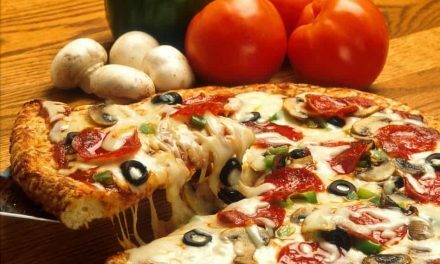 The cooking surface is 16 inches long and 11 inches wide, which equals to an extra large frying pan. For this reason, you can use it to cook multiple foods at once. The cooking surface and the lid are made of 100% stainless steel which means there are no coatings to worry about. The electric cord is removable so you can easily wash it in the sink, and it is super easy to clean! What we loved the most about this electric skillet by De’Longhi is the fact that both the lid and the skillet base are completely immersible, which means they can also go in the dishwasher! Cleaning up an electric skillet has really never been easier. The body of the skillet is made of aluminum, and you can easily adjust the temperature precisely using the temperature control wheel. 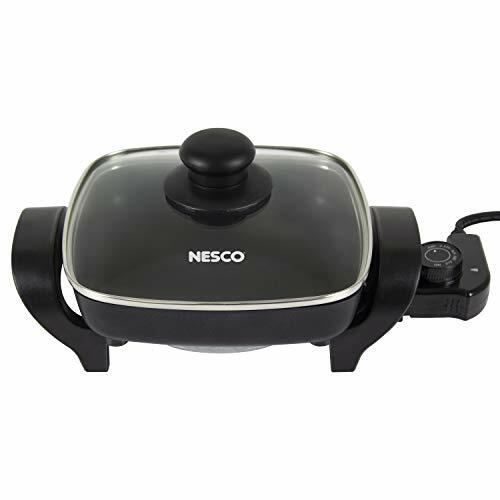 Another special feature on this electric skillet is the adjustable steam vent holes. You can close them to keep the moisture and flavors in or open them if the fish you are cooking requires the steam to evaporate. This electric skillet by NESCO features a square cooking surface that is 8 inches long and 8 inches wide coupled with 1800 watts of power. The die-cast aluminum pan is 2 inches deep, which allows you to use it for anything from making eggs to making a small pot roast. What we especially loved about this skillet is the tempered glass lid that allows you to see what’s going on in the pan without removing it. Both the skillet base and the lid are dishwasher safe. Made in France by De Buyer, this carbon steel skillet may easily become your best friend in the kitchen! This pan measures 12.6 inches in diameter, which means it’s quite large and also rather heavy (it weighs 6.3. pounds). However, it has a long handle on one side and a helper handle on the other so handling the weight shouldn’t be too much of a problem. The long handle is tightly secured with three rivets and slightly raised than curved, which is a characteristic of traditional French design and quite comfortable to use too. The pan itself is made of 99% pure iron, so it works with induction cooktops too. Finally, De Buyer covers their carbon steel pans with beeswax before shipping in order to protect the pans from oxidations and ensure they are in a perfect condition when they get to you. 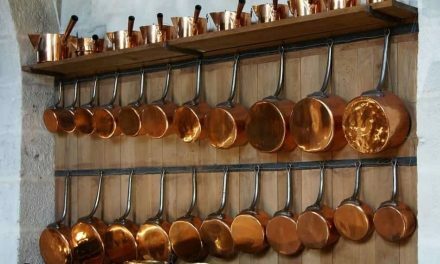 Matfer Bourgeat is a French family-owned company best known for making copper cookware. However, they are always focused on innovation and making new products that are convenient and functional in modern kitchens. This is why the Matfer Bourgeat 062005 Frying Pan was created. Made of carbon steel, this pan provides amazing performance. It weighs only 4 pounds, and if seasoned properly it can be amazingly non-stick. Finally, a firmly attached steel handle ensures that you can use this pan for years to come without any problems. This piece from Lodge is another amazing carbon steel skillet. Made in the USA, it’s lighter than cast iron pans but still provides amazing heat retention while being more flexible at the same time. This pan is suitable to be used on extremely high temperatures, and unlike some other pans, it won’t warp no matter what you do to it. 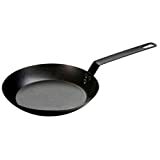 The Lodge 12 Inch Seasoned Carbon Steel Skillet can also be used on all kinds of cooktops. It needs to be hand washed, though, but if you season it properly you’ll get an amazing non-stick surface without any harmful chemicals. NextWhat are the Best Cookware Brands?